TabSite offers the integration of Mail Chimp by default for all plans and with any Premium App the ability to add any other form code from providers like Constant Contact, iContact, Aweber, Salesforce, and more. There is also the code widget that can be used for integrations. 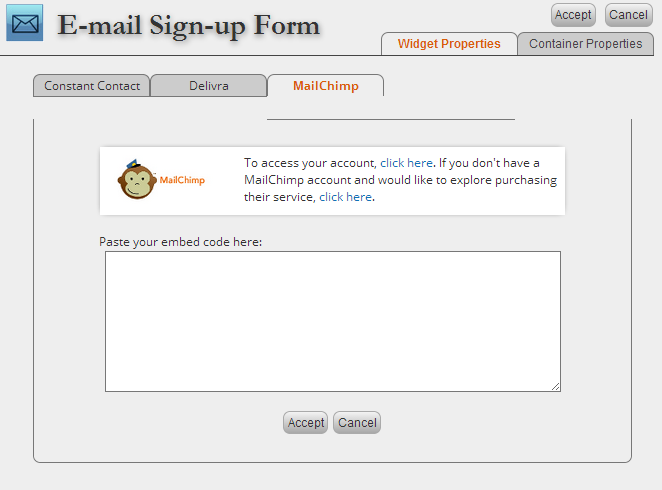 Users of TabSite can click the "E-mail Icon" (see images below) that allows them to add their EMail code to create the form. EDITING A PREVIOUSLY CREATED CONTENT WIDGET: To edit the content that you have previously added to your TabSite, right click on your Content, and click on edit. This will bring up your editor again. You can also go to the "Layers" tab in the TabSite Manager below "Widgets" and click the Edit link next to the Content Widget you want to edit. This window will appear. Just choose Save & Continue or Save and Close, and click Okay for the succeeding windows. See the various packages and tools here: >> Compare TabSite packages.